WELCOME TO A WORLD OF INSPIRATION! We are very proud to present you our new catalogues for 2018! In this edition you will find a world of inspiration with even more spectacular lighting, accessories, furniture and decoration. We worked very hard with a great team to make the finest collection. We want to show you our collection in many ways, these catalogues are one of them. You can also visit one of our beautiful showrooms, you can check the complete collection online or visit one of the stunning trade fairs across Europe. still produce our own shades, also for the last 45 years! We still make them by hand in Noordwijk. We are also proud to tell you that we have expanded our collection yet again with many new items, in furniture, textiles and of course in lighting. Check out our new bulbs, all LED and dimmable. We hope you will be inspired with so many new ideas and ranges. We look forward to welcome you again. WILLKOMMEN ZU EINER WELT VON INSPIRATION! Wir sind sehr stolz, Ihnen unseren neuen Katalog für 2018 zu präsentieren! In dieser Ausgabe werden Sie eine Welt der Inspiration finden mit noch mehr spektakulärerer Beleuchtung, Accessoires, Möbel und Dekorationen. Wir haben sehr hart mit einem großartigen Team gearbeitet, um die beste Kollektion zusammenzustellen. Wir wollen Ihnen unsere Kollektion in vielerlei Hinsichten zeigen, dieser Katalog ist einer davon. Besuchen Sie unseren schönen Showroom, schauen Sie sich die Kollektion online an oder besuchen Sie einer der atemberaubenden Messen in ganz Europa. Light und Living ist seit über 45 Jahren etabliert und wächst jedes Jahr weiter. Lighting as a mood-setter With over 45 years of experience in the lighting industry, we know exactly what lighting can do for a room. Decorative Lighting is what makes or breaks a space. It is a reflection of a personality turned into design. It is believed to be one of the most important elements in any space and is the mood-setter of a room. Since lighting is our companyâ&#x20AC;&#x2122;s roots, we proudly introduce our new 2018 - 2019 lighting collection first, and invite you to begin your search for inspirational products within these pages. These Warden floorlamps are included with a 5 watt led bulb! Leather products are natural products that are individually unique; Therefore, our warehouse cannot do matching of these products. Families : unity in diversity Sometimes the interior of a room needs unity. One of the ways to create that, is to use lighting-families: different lamps matching each other. Light & Living offers coordinating options for various lighting types, so your customers can easily achieve a harmonized look throughout a room. Shades in all shapes, colors and sizes Originally a manufacturer of lampshades, Light & Living takes pride in offering the best materials and styles from Europe. With a wide variety of shapes and colors to match your style, you can be sure to find exactly what you are looking for. Cowhides are natural products that are individually unique; Therefore, our warehouse cannot do matching of these products. Because we care about the environment one of our company values is to treat our customers, suppliers and the planet with respect. When it comes to decorative light bulbs it can be difficult to find ones which are environment friendly. After a while of searching and testing we have now found, beautiful, stylish and yet eco proof bulbs. Our new range of LED light bulbs have a warm color tone and a decorative wire for the great look. LED doesn’t heat up much and they don`t use a lot of power which makes them much more eco-friendly. Besides that they have a much longer life span, this way we also have less waist on our planet. Discover it yourself, this wonderful alternative to the traditional light bulb. Our new LED filament bulbs are just that! Because we care about the environment one of our company values is to treat our customers, suppliers and the planet with respect. When it comes to decorative light bulbs it can be difficult to find ones which are environment friendly. After a while of searching and testing we have now found, beautiful, stylish and yet eco proof bulbs. Our new LED filament bulbs are just that! EN • Order easy and fast • Get inspired by our theme pages • Filter and search on product groups, materials, colors, shapes, names or article numbers • Log out and finish order later • Automatic order confirmation DE • Einfach und schnell einkaufen • Lassen Sie sich von unserem Website-Artikeln begeistern • Filtern un Suchen nach Produktgruppen, Materialien, Farben, Formen, Namen oder Artikelnummern • Loggen Sie aus und machen Sie den Auftrag später fertig • Automatische Orderbestätigung FR • Commander facilement et rapidement • Etre inspiré par nos pages thématiques • Filter par groupe de produits, matériaux, couleurs, formes, article ou nom de série • Quitter et terminer la commande plus tard • Recevoir automatiquement une confirmation de commande French: light-living.fr | Dutch: light-living.nl | German: light-living.de English: eu.light-living.com | UK only: light-living.co.uk (£) EN You can order the entire Light & Living collection easily, quickly and 24/7 online in our webshop. First create an account via our website. You will receive an activation e-mail with your customer number within 48 hours. DE Die ganze Light & Living Kollektion bestellen Sie einfach und schnell, rundum die Uhr, in unserem online Webshop. Erstellen Sie über unsere Website einen Account. Sie empfangen Innerhalb von 48 Stunden eine Aktivierungs-E-Mail mit ihrer Kundenummer. FR Vous pouvez commander toute la collection Light & Living sur notre boutique en ligne, facilement, rapidement et en ligne, 24h / 24 et 7j / 7. D’abord, créer un compte via notre site web. Vous recevrez un e-mail d’activation avec votre numéro de client sous 48 heures. 24/7 Also compatible on desktop, tablet and smartphone! VISIT OUR SHOWROOMS TO SEE OUR FULL RANGE OF PRODUCTS! 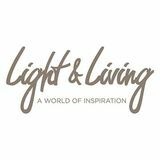 Light & Living - A world of inspiration!